Fax (short for facsimile, from Latin fac simile, "make similar," that is, "make a copy") is a telecommunication technology used to transfer copies (facsimiles) of documents, especially using affordable devices operating over the telephone network. The word telefax, short for telefacsimile, for "make a copy at a distance," is also used as a synonym. The fax machine is an example of a democratizing technology, allowing individuals with no access to printing presses or mass media outlets to produce and disseminate printed material. During the 1989 student protests at Tiananmen Square in Beijing, supporters with fax machines were able to spread news of the demonstrations throughout the country, and thus, considerably enhance their political impact. A fax machine is essentially an image scanner, a modem, and a computer printer combined into a highly specialized package. The scanner converts the content of a physical document into a digital image, the modem sends the image data over a phone line, and the printer at the other end makes a duplicate of the original document. 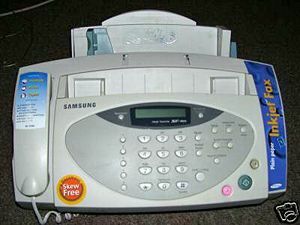 Fax machines with additional electronic features can connect to computers, can be used to scan documents into a computer, and to print documents from the computer. Such high-end devices are called multifunction printers and cost more than fax machines. Although fax machines of some sort or another have existed since the mid-late nineteenth century, modern fax technology became feasible only in the mid-1970s as the sophistication and cost of the three underlying technologies dropped to a reasonable level. Fax machines first became popular in Japan, where they had a clear advantage over competing technologies like the teleprinter; at the time, before the development of easy-to-use input method editors, it was faster to handwrite kanji than to type the characters. Over time, faxing gradually became affordable, and by the mid-1980s, fax machines were very popular around the world. Although most businesses still maintain some kind of fax capability, the technology appears increasingly dated in the world of the Internet. With advances in modern technology, some multifunction printers that include faxing capabilities can also internet fax in addition to printing, copying, scanning, and sending email. Scottish inventor Alexander Bain is often credited with the first fax patent in 1843. He used his knowledge of electric clock pendulums to produce a back-and-forth line-by-line scanning mechanism. Frederick Bakewell made several improvements on Bain's design and demonstrated the device at the 1851 World's Fair in London. In 1861, the first fax machine, Pantelegraph, was sold by Giovanni Caselli, even before the invention of workable telephones. In 1924, a designer for RCA, Richard H. Ranger, invented the wireless photoradiogram, or transoceanic radio facsimile, the forerunner of today’s "fax" machines. A photograph of President Calvin Coolidge sent from New York to London on November 29, 1924, became the first photo picture reproduced by transoceanic radio facsimile. Commercial use of Ranger’s product began two years later. Radio fax is still in common use today for transmitting weather charts and information. An early method for facsimile transmission, the Hellschreiber, was invented in 1929 by Rudolf Hell, a pioneer in mechanical image scanning and transmission. Prior to the introduction of the now ubiquitous fax machine, one of the first being the Xerox Qyx in the mid-1970s, facsimile machines (the word "fax" had not yet been coined) worked by optical scanning of a document or drawing spinning on a drum. The reflected light, varying in intensity according to the light and dark areas of the document, was focused on a photocell to be converted to an electrical signal varying in frequency. This audio tone was then transmitted using a common telephone handset inserted in an acoustic coupler serving as a modem. At the receiving end, the same technique (handset in acoustic coupler) converted the varying tone into mechanical movement of a pen or pencil to reproduce the image on a blank sheet of paper on an identical drum rotating at the same rate. A pair of these expensive and bulky machines could only be afforded by companies with a serious need to communicate drawings, design sketches or signed documents between distant locations such as an office and factory. In 1985, Hank Magnuski produced the first computer fax board, called GammaFax. There are several different indicators of fax capabilities: Group, class, data transmission rate, and conformance with ITU-T (formerly CCITT) recommendations. Group 1 faxes conform to the ITU-T Recommendation T.2. Group 1 faxes take six minutes to transmit a single page, with a vertical resolution of 98 scan lines per inch. Group 1 fax machines are obsolete and no longer manufactured. Group 2 faxes conform to the ITU-T Recommendations T.30 and T.3. Group 2 faxes take three minutes to transmit a single page, with a vertical resolution of 100 scan lines per inch. Group 2 fax machines are almost obsolete, and not manufactured. Group 2 fax machines can interoperate with Group 3 fax machines. Group 4 faxes conform to the ITU-T Recommendations T.563, T.503, T.521, T.6, T.62, T.70, T.72, T.411 to T.417. They are designed to operate over 64 kilobit-per-second digital ISDN circuits. Their resolution is determined by the T.6 recommendation, which is a superset of the T.4 recommendation. Class 2.1 fax devices are referred to as "super G3;" they seem to be a little faster than the other 2 classes. Several different telephone line modulation techniques are used by fax machines. They are negotiated during the fax-modem handshake, and the fax devices will use the highest data rate that both fax devices support, usually a minimum of 14.4 kilobit-per-second for Group 3 fax. Note that Super Group 3 faxes use V.34bis modulation that allows a data rate of up to 33.6 kilobits per second. Modified Huffman (MH) is a codebook-based run-length encoding scheme optimized to efficiently compress whitespace. As most faxes consist mostly of white space, this minimizes the transmission time of most faxes. Each scanned line is compressed independently of its predecessor and successor. Modified Read (MR) encodes the first scanned line using MH. The next line is compared to the first, the differences determined, and then the differences are encoded and transmitted. This is effective as most lines differ little from their predecessor. This is not continued to the end of the fax transmission, but only for a limited number of lines until the process is reset and a new "first line" encoded with MH is produced. This limited number of lines is to prevent errors propagating throughout the whole fax, as the standard does not provide for error-correction. MR is an optional facility, and some fax machines do not use MR in order to minimize the amount of computation required by the machine. The limited number of lines is two for standard resolution faxes, and four for fine resolution faxes. A proprietary compression scheme employed on Panasonic fax machines is Matsushita Whiteline Skip (MWS). It can be overlaid on the other compression schemes, but is operative only when two Panasonic machines are communicating with one another. This system detects the blank scanned areas between lines of text, and then compresses several blank scan lines into the data space of a single character. Group 3 fax machines transfer one or a few printed or handwritten pages per minute in black-and-white (bitonal) at a resolution of 100×200 or 200×200 dots per inch. The transfer rate is 14.4 kilobits per second or higher (but fax machines support speeds beginning with 2400 bits per second). The transferred image formats are called ITU-T (formerly CCITT) fax group 3 or 4. The most basic fax mode transfers black and white only. The original page is scanned in a resolution of 1728 pixels per line and 1145 lines per page (for A4). The resulting raw data is compressed using a modified Huffman code optimized for written text, achieving average compression factors of around 20. Typically a page needs 10 s for transmission, instead of about three minutes for the same uncompressed raw data of 1728×1145 bits at a speed of 9600 bits per second. The compression method uses a Huffman codebook for run lengths of black and white runs in a single scanned line, and it can also use the fact that two adjacent scanlines are usually quite similar, saving bandwidth by encoding only the differences. There are different fax classes, including Class 1, Class 2, and Intel CAS. Fax machines from the 1970s to the 1990s often used direct thermal printers as their printing technology, but since the mid-1990s there has been a transition towards thermal transfer printers, inkjet printers, and laser printers. One of the advantages of inkjet printing is that inkjets can affordably print in color; therefore, many of the inkjet-based fax machines claim to have color fax capability. There is a standard called ITU-T30e for faxing in color; unfortunately, it is not yet widely supported, so many of the color fax machines can only fax in color to machines from the same manufacturer. An alternative to a physical fax machine is to make use of computer software which allows people to send and receive faxes using their own computers. Margolis, Andrew. 1995. The Fax Modem Sourcebook. Hoboken, NJ: Wiley. ISBN 0471950726. Kauffman, Maury. 1998. Internet and Computer Based Faxing, Second Edition: The Complete Guide to Understanding and Building IP and G3 Fax Applications. Manhasset, NY: CMP. ISBN 1578200245. McConnell, Kenneth R., Dennis Bodson, and Stephen Urban. 1999. Fax: Facsimile Technology and Systems. Norwood, MA: Artech House Publishers. ISBN 0890069441. All links retrieved March 26, 2017. This page was last modified on 26 March 2017, at 23:43.